A modification for Minecraft created using Minecraft Forge and Universal Electricity. 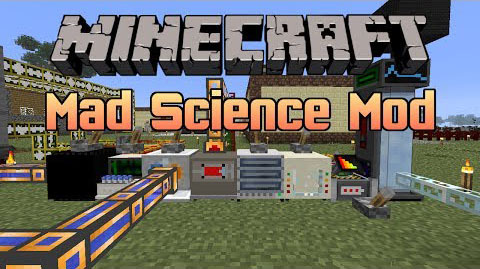 It adds machines, items, and mobs to create your own laboratory! Remember kids, science has no limits? and no bounds? Our scientists have worked hard to bring you some of the finest equipment for genetic research Minecraft has to offer. These custom built machines fit into one of three separate categories. The categories represent the different stages of the game in which you will encounter them, and also will be expected to craft at that tier of the game. Harness powerful machines like the Computer Mainframe to combine multiple Genome Data Reels to create new and crazy forms of life such as the Disgusting Meat Cube! Use the Cryogenic Tube to harvest electrical power from Villagers memories, you can also playback existing Memory Data Reels for maximum power output! Create spawn-eggs for mobs using the Genome Incubator! No need to perform crazy experiments unless you want! Discover the true purpose of Nether Quartz! This vanilla Minecraft ore has been fully realized as the source for technology in this mod. Using the Thermosonic Bonder and the purified version of Nether Quartz known as Fused-Quartz you can create Silicon Wafers, CPUs, RAM, and myriad of other circuits. Recycle all components created and used. With custom blocks like the Syringe Sanitizer to clean your dirty needles and the Cryogenic Freezer to keep your DNA Samples and Filled Syringes nice and fresh you will be able to store those samples indefinitely until you are ready to experiment.